To download these images, you may follow the link to each image and select "Save As..." from your browser's File menu. Most browsers also provide an option to save the image in their popup menu, which is access by clicking with the right mouse button (or holding the button for a few seconds on a one-button Macintosh mouse). This board differs slightly from rev A, as I discovered a few errors in the layout, which were of course corrected for rev A. 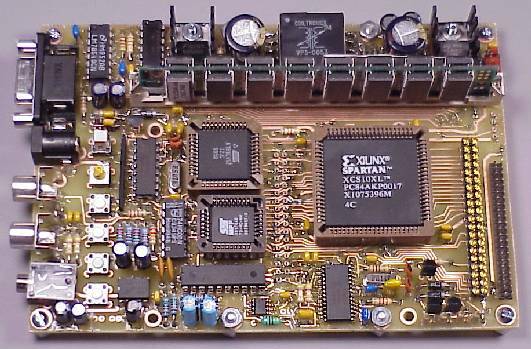 When assembling the board, many connections are made on the component side of the board. This poses a serious problem for soldering the PLCC sockets and SIMM socket. I used single-pin insert sockets, which are visible in the photo between the microcontroller and flash rom (the two smaller PLCC chips) and the large FPGA chip. They must be soldered on both sides for many locations, and soldering on the top is tricky, as a slight wrong movement will flood the socket with solder. These single-pin inserted sockets are available from Digikey (TODO: find exact part number I used). Unfortunately, they are expensive, but there is little other choice. They also require special PLCC sockets with narrow pins.